Adding content can be as general as adding from your Dashboard or the Folders view or as specific as adding an attachment to a specific task. 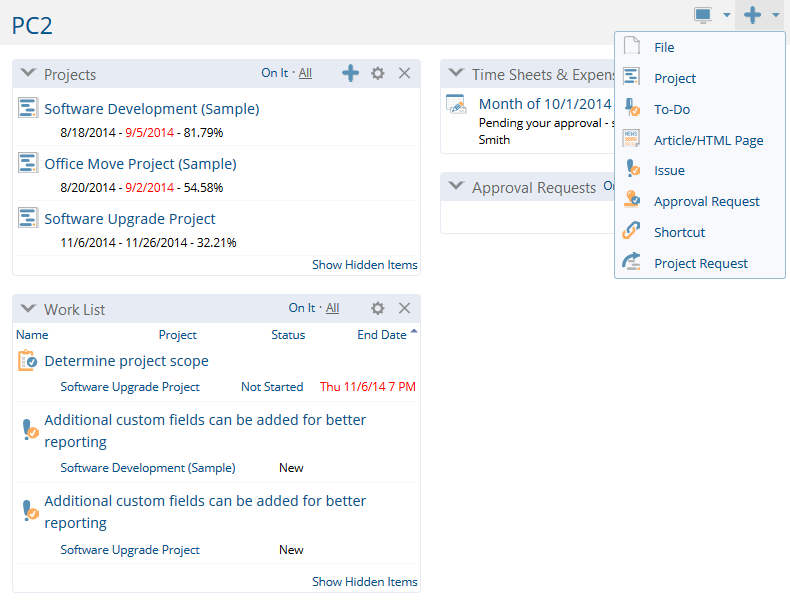 Remember when adding content that Project Insight users have different access permissions. While an administrator will see content added in any area, a team member may only see content added to a specific task that he or she has been assigned to. You may want to reach out to your Project Manager or Administrator for guidance on where to add content. A difference between Project Insight content or item management and other data environments is that many item types allow the attachment of other item types. The simplest example of this is the common use of folders as items within which files, projects, threads, sub-folders etc. are placed. The difference is that in addition to being added to a given folder, the content types listed above can also be attached to other item types. For example, you could start a thread for a discussion, and then upload a file attachment to the thread. From your dashboard you will be able to use the add icon to add content. You will notice that not all types of content are available at this level as some require you to at least be at the folder level. When viewing any base folder, you'll see various items within the list. In the example below there are folders for customers with projects inside them. There is also a special calendar and two Excel documents. If you were to add content from the folder view using the add icon , you would be adding it to the Projects folder. It would show up exactly like the special calendar and two Excel documents do below. If you want to add content into a certain project, you would go into the project and add from there. When viewing any project, there is always a drop-down available called Views. Within Views, there is Documents. When you click into this area and then add content, you are adding it at the specific project level. Using the same add icon as at the Folder level, you can add a number of different types of content. Within a project there might be 10 or even hundreds of tasks. When you want to be very specific, you can add content to a specific task. For example, there might be a spec document that pertains only to this one task. In this situation, it’s most logical and useful to attach the item to the task and not the project, to prevent populating the project environment with items that other task owners would not otherwise need to encounter.